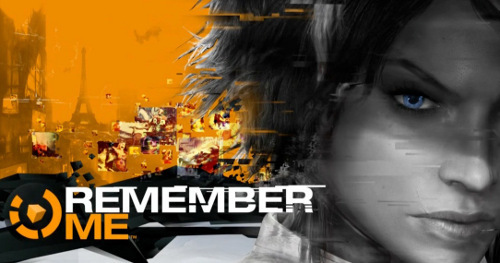 Remember Me is the first release from French studio DONTNOD and is available now for PS3, Xbox 360 and PC. 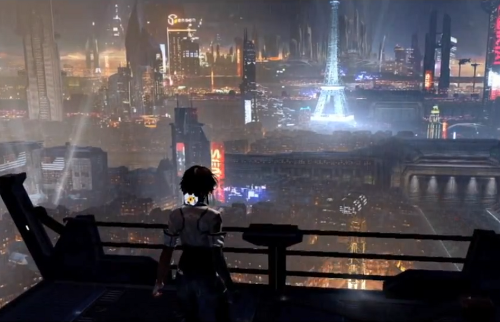 The game focuses on Nilin, a memory hunter fighting against Memorize, a corporation whose digital memory implants have transformed the lives of everybody in Neo-Paris. As you might expect from such a setup the game exists within a cyberpunk (technically neo-cyberpunk given the wireless nature of the technology employed) setting and opens with Nilin having her memory forcibly extracted. From there you take on the role of Nilin as she struggles against Memorize to recover her identity and understand why she was fighting them to begin with. From the start it is clear that DONTNOD get cyberpunk and its aesthetics. Neo-Paris is a beautifully designed dystopian city of high tech, high living built upon a dirty, cobbled together underworld that still maintains a colourful (and often neon) way of life. Visually the world is not only stunning but thought out, stylistic choices are both consistent and logical, building together to make for an extremely believable city. Similarly Nilin is presented in a fairly realistic style, her main outfit isn’t some futuristic one piece, its jeans, a plain top and a jacket. Yeah they add some future tech such as her boots (which have some sort of exoskeleton extending from them) and Sensen memory tech (which visualise as holograms around one arm and on the back of her neck) but the core of her outfit is, like the rest of the world, built on a believable and, for want of a better description, normal look. It is this grounded yet developed sense of normality that makes the game world feel alive, something which is often overlooked in other similar settings. As the game progresses it explores, in true cyberpunk fashion, the relationship between the two co-dependent halves of Neo-Paris while also exploring a number of other themes central to the genre (though to avoid spoilers I’ll avoid even mentioning which themes). It does this extremely well and as with the visual identity the story is tight, well written and develops at a sensible pace. Before moving on to the gameplay I just want to quickly highlight one other aspect, the soundtrack. It is, quite simply, brilliant and adds that final piece of atmosphere to the game. In particular its implied use of digital artifacts, moments where the music jerks or stutters, are truly inspired and really help in projecting an immersive digital world. The second, bigger issue, is the combat. On the outset the approach is reminiscent of the combat in the Batman Arkham games but with a bigger focus on combo’s, which are managed through the Presens system. The concept of the system is simple, given a set combo (ie Square-Triangle-Triangle) you can customise the effect of the combo at each stage by assigning certain presens to it. The presens themselves are assigned to 1 of 4 types: damage boost, health regen, cooldown boost and chain multiplier. So for example you could combine 3 damage boosts together to generate a hard hitting combo or combine health regeneration with cooldown (which increases the frequency with which your special moves can be employed). On the surface this is a great idea but like other aspects of the gameplay fails to come together as effectively as it needs to. The biggest problem is that the combat just doesn’t flow as well as it should. This makes the bigger combos unnecessarily difficult to pull off when fighting larger groups of enemies, either due to being hit or because you’re constantly dodging attacks. In theory it’s possible to continue a combo after dodging but I found this to be particularly difficult to do and therefore avoided using the longer combos during most encounters. Again a comparison with the Batman games is apt, where larger groups of opponents make it all the easier to flow combos together and where it is possible to dodge and simply continue the combo against a different opponent. Without that flow the encounters of Remember Me often become frustratingly difficult, which severely detracts from the game as a whole. Perhaps the most unusual gameplay element is that of the memory remixes, where Nilin alters somebodies memories in order to change their personality or outlook on life. It would have been easy for DONTNOD to have merely employed a cutscene for these sections but instead provide a mechanism to alter the scene by identifying memory glitches, which when changed impact on how the scene develops. 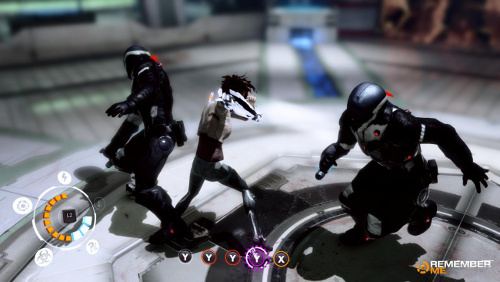 While these sections typically boil down to trial and error (change a glitch, see what happens, rewind and try again with a different combination of glitches) the remix scenes are used sparingly enough that they don’t become boring and each instance provides a rather unique insight into the motivations of both the character being remixed and Nilin herself. All in all Remember Me is an extremely difficult game to review, which explains how polarizing other scores have been (I’ve seen as low as 1/5 and as high as 4/5). It is, in the truest sense, a diamond in the rough, a game that has everything it needs yet one that also fails to pull it together into a cohesive whole. For me the setting and world DONTNOD has developed is enough to counter the deficiencies in gameplay but I can also appreciate how that won’t be the case for many others. So Star Trek: Into Darkness. An idiotic over the top summer blockbuster which lacks any intelligent consistency as it rushes from one ludicrous action scene to the next. Not worthy of bearing the name Star Trek. What follows below the cut is going to contain SPOILERS, so don’t say I didn’t warn you. While I’m a big fan of gadgets, gizmos and things which make me go ‘ooh thats nifty’ I don’t buy them as often as I’d like to, partly because I have some self restraint (and more than when it comes to gaming stuff) but also because I have a use it till it dies approach to the ones I do buy. In the case of computers this will often be a literal case of until it dies, which is why I’m still using Vista on my main laptop (and why my netbook, which I still use, came with XP originally). Outside of gaming and technology one of the things that often gets my interest are coffee related gizmos but until now I’ve managed to avoid purchasing many. For the most part the reason for this is simple, while I love freshly ground coffee I’m generally too disorganised and asleep in the morning to enjoy one before I head out to work. 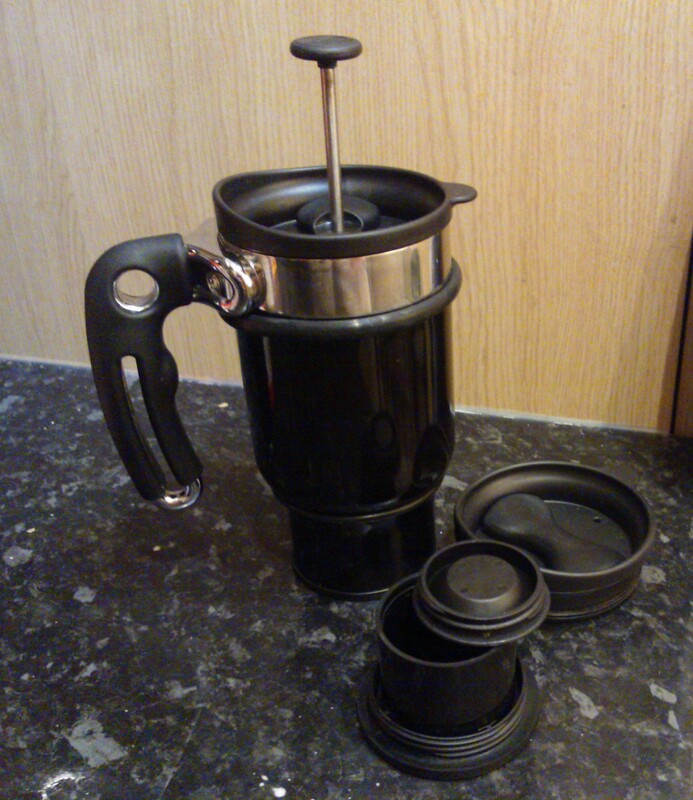 To get round this I tend to drink a mug of instant on my walk to my train, it gets me my caffeine fix but means I only get to enjoy cafetiere coffee at the weekend. Until now that is. Yup, I bought myself a new gizmo or more accurately a Planetary Design Doubleshot Coffee Mug. As you can probably tell from the photo it combines a standard travel mug with a cafetiere, thus allowing me to enjoy freshly ground coffee on the way into work but without the requirement that I be any more organised (or awake) than I am on a normal day. Things get better however, for the bottom half of the mug contains a sealed compartment into which extra spare grounds can be stashed for use later in the day. While I’m still getting to grips with the doubleshot, by which I mean what is the optimal amount of grounds to use, I can already say that it’s been a worthwhile purchase. The mug is sturdy, well designed and the compartment for additional grounds is, well, genius. I bought mine from Ethical Addictions Coffee and apart from a few issues with the courier (who seemed intent on making it impossible to arrange a redelivery attempt) I’d definitely recommend them, just ship things through Royal Mail instead. Shadowrun 2050 is tagged as an historical setting book for Shadowrun 4th edition, with the aim of allowing GM’s to run 4th edition games in the world originally presented by the 1st edition rules. The book is split into 8 main sections, the first 5 of which cover world background while the last three are more focused more upon the game system itself. As with most Shadowrun products there are also a number of short stories spread throughout the book. Before I continue I want to highlight the two primary aspects which heavily influenced my purchase of this book. 1. Shadowrun 4th edition is, in many ways, not cyberpunk; the setting has moved on to that of post-cyberpunk. 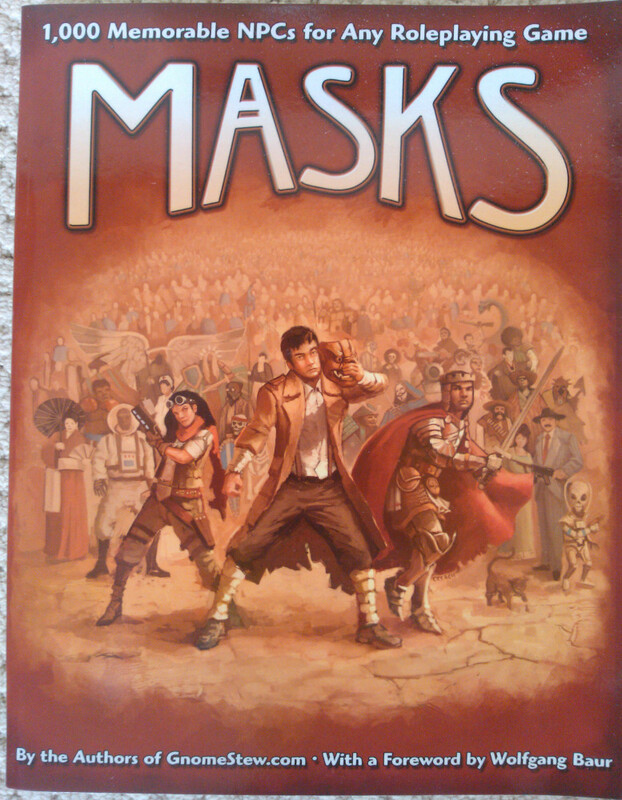 It’s had to due to the continuous timeline, which has progressed progressed by over 20 years since first edition. In turn the technology of the game has also developed, most notably through the introduction of the wireless matrix and augmented reality. As a friend of mine would say, “it’s not cyberpunk if you don’t plug a keyboard into your head”. Shadowrun 2050, therefore, appealed to the purist in me, the one that wants to be able to play in a classic setting while using the latest ruleset. Don’t get me wrong, I enjoy the post-cyberpunk setting as well, but it’s the classic 80s cyberpunk that inspired me to buy this book. 2. I am not a veteran of Shadowrun, I haven’t played previous editions and don’t have access to a library of old sourcebooks or adventures. I’d hoped that this book would make up for that, providing the details and flavour needed to run a classic game of Shadowrun. The first five sections of the book concern world background information, aimed at providing the flavour needed to run a game in the 2050 setting and are presented in the form of matrix posts made by prominent Shadowrunners of the period. 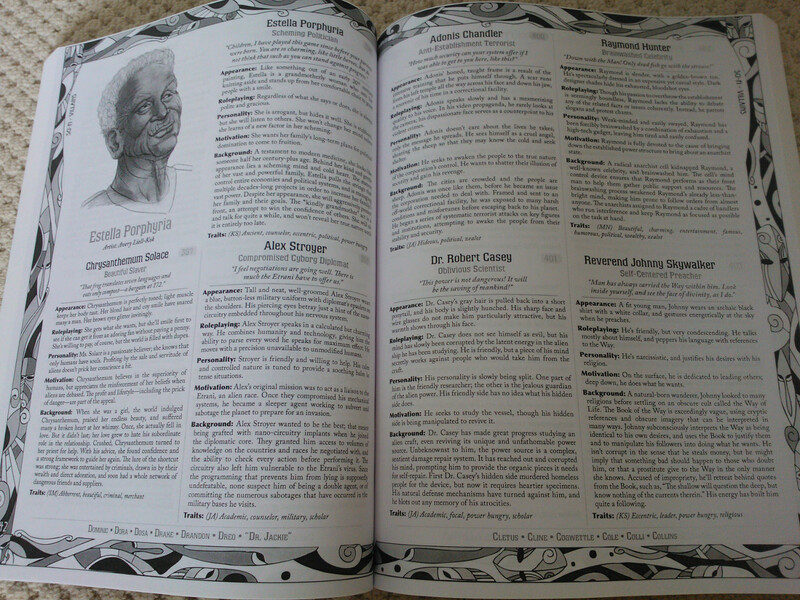 Briefly, these sections introduce some background on the major Corp’s and gangs, influential individuals, a breakdown of three major locations (Seattle, Chicago and Hong Kong), the types of jobs available and some sample characters before finishing up on a short ‘Life in 2050.’ While these sections (and accompanying fiction) take up around three quarters of the book they are annoyingly short on substance. Each of the topics are presented as the not much more than the briefest of introductions and with no comparison to how they differ from that of the 2070s, which is the default setting for the 4th edition rules. This is especially frustrating during the section on the types of jobs available, as by and large this hasn’t changed between editions. In contrast details on how these jobs differ between the periods, such as the types of security present or how to give NPCs a 2050’s flavour are absent. The final quarter of the book focuses more upon the system, introducing changes to magic and the matrix that fit better with the original 1st edition material. The magic chapter covers the three major traditions of the time, Shamanic, Hermetic and Buddhist, introducing tweaks to the spell categories available to each as well as reintroducing rules for grounding spells (affecting the physical world while in astral space) that were present in earlier editions of the game. Following this the matrix chapter returns hacking to its roots, detailing cyberdecks and the nodal structure of networks in the 2050’s. Common programs, IC and actions which can be taken in the matrix are also covered by this chapter with enough detail to be of actual use when playing the game. Bringing the book to a close is a fair sized gear chapter, listing the sort of equipment that would have been available to runners at the time, which includes bio- and cyberware (which, in my opinion, could have easily had a chapter to itself). All in all this book was quite disappointing and appears to have been written to appeal to Shadowrun veterans who are nostalgic for the older editions. The background provided on the 2050s feels like somebody has merely summarised the setting and adventures from 1st edition without bothering to focus on any details of the period or how it differs from the default setting of 4th edition.If each section had included a ‘How this differs from the 2070s’ or ‘Using [faction X] in your game’ I’d be tempted to think more highly of the book, as it stands however the only sections I’m ever likely to refer to are those relating to the system changes, a mere quarter of the total page count. This review was originally published at http://nearlyenoughdice.com/review-technoir on the 24th of November. Mix one part cyberpunk with equal measures of hard boiled investigation and film noir before pouring into a glass made from a lightweight rule system. 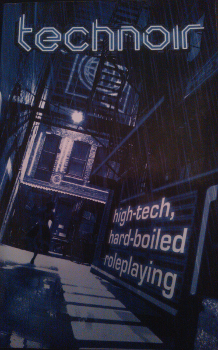 Serve in a smoke filled bar, under the shadow of a looming Corporate skyscraper and you’ve got yourself Technoir, an original RPG by Jeremy Keller and published by Cellar Games. It is available from www.technoirrpg.com and on RPG Now. One of the early RPG successes from Kickstarter Technoir is a cyberpunk styled game heavily flavoured by hard boiled detective fiction and film noir. The game is presented in a compact and beautifully laid out form, small enough that its easy to just slip the book into a bag just in case you get a chance to play it. If you’re looking for long sessions of planning, stealthy infiltration and stats for an endless list of cybernetics then I suggest sticking to Shadowrun. Technoir is about bold and reckless action, its about causing trouble because you can and flinging accusations just to see what sticks. Technoir uses a lightweight rules system built around the use of Adjectives, which describe the result of actions, properties of objects and relationships between characters and their connections. Want to shoot somebody? Then you might apply the adjectives of Suppressed, Bleeding or even Scared; it all depends on how you want to affect the target and how long you want the Adjective to last. In a similar fashion Adjectives may be applied to represent emotional or situational (Distracted, bored, lustful etc) effects, describe the properties of items (Sharp, Rapid-fire, Expensive etc), and define the relationships between characters and their connections (Respectful, Loyal, Indebted etc). Actions are attempted by generating a pool of d6′s, formed from characters attributes (Action dice), positive adjectives they can draw on (Push dice) and negative adjectives affecting the character (Harm dice, of which a character has a limited number). These are rolled together, with Harm dice cancelling out any positive dice of equal value, and the highest remaining die then compared to the target number. If successful the adjective is applied as desired. It is here however that the Push dice really come into play as by default Adjectives applied through a successful action don’t last for long. If you wish to extend the duration of the effect, for example upgrade a ‘Suppressed’ to ‘Bleeding’, it requires that a Push die be spent, transferring it from the Player to the GM. In this way the game brings in an ebb and flow of power that fits well with the noir genre implied by the games title. At the start of each adventure Push dice reside with the PCs, allowing them to quickly investigate and get the information required to work out what is going on. As the dice flow to the GM the balance shifts and the PCs start to run up against larger challenges, difficult to overcome without the boost provided by Push dice. Here the GM can then start to really hurt the PCs, applying longer lasting adjectives (which confer Harm dice) but in order to do so must once again spend the Push dice, returning them to the control of the players. Finally the PCs, bruised and beaten but in possession of the Push dice, are in a position to uncover the truth and take out the bad guy at the centre of their troubles. All in all the system works well and finds a good balance by bringing together traditional mechanics (rolling dice), player narrative (adding adjectives) and genre (the Push dice economy) into a single cohesive system. My experience with the system so far is that it works best when an adventure is spread over 2 or 3 sessions, one shots limit the impact of longer lasting adjectives on NPCs as they don’t appear in enough scenes. Longer adventures however and the PCs build up too many negative adjectives, severely limiting their effectiveness. The only real issue I’ve had with the system is getting to grips with the focus on character versus character conflicts, as the GM is advised to avoid rolls that don’t involve manipulating / affecting another character in some way. This makes sense from both a genre and system perspective, as applying adjectives to say, pick a lock, doesn’t make a big impact if that lock is never encountered again. I suspect part of my issue with this is that my NPCs are probably the weakest aspect of my GMing so only time will tell as to whether I can get a handle on this aspect of the game. Transmissions, which make up a substantial portion of the book, are a system for the generation of on the fly adventures which are generated as information is uncovered by the characters. Each Transmission forms a small setting, something which is mostly absent from the main game, however even these settings leave much up to the imagination of the GM. There are 3 Transmissions included in the book itself and each contains within it a series of contacts (NPCs who can provide favours to the PCs), locations, events, factions, threats and objects. At the start of the adventure the GM takes 3 of these elements and uses them to form a story seed, as the PCs explore and investigate they draw in further elements which the GM connects to that initial seed. For example if a PC goes to a contact to borrow some money that NPC is added to the plot map and suddenly they may be connected to a spate of kidnappings the PCs are investigating, maybe she’s involved in laundering the money of the gang involved or her son is one of the individuals who has been taken. The plot map, generated from each of these elements merely provides the links between points in the adventure, its up to the GM to decide what those connections are. The Transmission system works extremely well, allowing a GM to generate a plot as it unfolds and as the PCs are drawn into the adventure. Of course this requires the GM be comfortable with working out details on the fly but even if you’re not comfortable with this the framework provides an easy to use, pre-generated set of points which can be used ahead of time to plan an adventure. There are a number of Transmissions which are already available and with their simplicity its easy to write more focused around your city or setting of choice. While the game is written from a cyberpunk perspective the relatively limited nature of the setting material makes the system extremely easy to adapt to other settings. As part of the Kickstarter project the author has already released MechNoir, which shifts the focus to Mars and adds in rules for the use of Mecha and is planning to release HexNoir, a magic / fantasy based adaptation for the game. From a personal angle I’ve been working on an adaptation for running games within the Dresden Files universe (which can be found here on this blog). This coupled to the compact size of the book and ease of writing new transmissions means the game is on my list of systems I’m happy to pack in my bag while travelling just in case I can slot a session of it in. Technoir is a game that I would definitely recommend to those who are fans of the cyberpunk genre, especially if they’d rather focus on the motivations and conflicts of characters as opposed to the stats of a particular piece of cyberware. The system underlying the game is distinct, easy to learn and encourages the styles of play expected of by the genre, with the added bonus of being easily hacked to fit other noir influenced settings. All in all definitely a game that I am glad to have taken that Kickstarter gamble on. Spec Ops: The Line was developed by Yager Development and published by 2K Games. The game is available on PC, PS3 and Xbox 360. As well as the review presented here the game sparked thoughts on the role of narrative connections, which will be the focus of a future article. Spec Ops: The Line is, at first glance, a fairly generic third person shooter and in many ways it is. The game however also offers something lacking in most games, something that only truly becomes apparent when you play through the entire game. It is this something extra that raises this game from a solid but generic shooter to an excellent and compelling experience. Before I discuss that aspect in detail lets look first at the setting and game play. Spec Ops: The Line is first and foremost a third person, cover based shooter with some basic squad command mechanics. In this respect the game is solid, offering all of the required functionality and game play expected but with little innovation or mechanics unique to the game. You are limited to carrying two weapons, a relatively small amount of ammo and a few grenades. Squad commands are relatively simple and focused primarily upon selecting targets for your comrades to focus their fire upon in addition to occasional special actions. The game possesses the usual range of difficulties and on the default normal mode enemies provide a sufficient challenge. Playing through the game on this difficulty there were a handful of points where I required multiple attempts to progress but they were infrequent enough that they felt challenging rather than frustrating. At this difficulty most unarmoured enemies can be killed with a couple of shots and during the course of the game there is only a single type of enemy (excluding vehicles) which cannot be killed with a single headshot. One of the nicest touches is the inclusion of what is best described as sand damage, shoot out particular windows or parts of ceiling and the sand which is piled up against them will come crashing in, potentially on top of enemies stuck behind cover. Based on game play alone I would score the game as a 7.0, a solid but generic shooter. What makes the game stand out from virtually every other third person shooter (and most other games) is the narrative connection forged during the game play. The actions taken as you play the game have a clear impact upon the characters and are designed to generate an emotional connection between the player and the events as they unfold. In saying this I’m not, primarily, talking about the typical make choice A or B points found in most games, the do I take the good option or the evil option. No, I am instead referencing what is arguably the central game play mechanic of every shooter, namely the killing of enemies. Let me say this again, this is a military shooter designed to make you feel something when you kill people. The point is valid, to the extent that either Drake has two distinct personalities (loveable rogue and merciless killer) or perhaps, more worryingly, that Drake the hero is in actuality an insane psychopath who takes pleasure in mass murder. Not surprisingly the fact that the protagonist of the game is a brutal killer isn’t something that the developers have focused on much, lest we start thinking of him as anything other than the basic Hero archetype. In sharp contrast Spec Ops takes three highly trained soldiers, people whose job it is to kill and places them into a situation where they are forced to do so. It does this so it can pull you in to the realities of war, showing the effect that killing can have even on those trained to do it. The consequences of your actions are revealed not only on the level of the unfolding story and visible impact on the psyches of the characters but also in smaller ways. The civilians terrified by your presence or the scribbled graffiti on the collapsed walls. Perhaps one of the most effective ways is that fallen enemies will often lie on the ground writhing in agony from non-fatal wounds. Easy enough to ignore perhaps, except that if you want to loot their weapons or ammo you must first complete the job, making that conscious decision to execute them where they have fallen. In a similar manner melee attacks can often be followed by quick kills, which are once again executed in such a way that they reinforce the brutality of what you are doing. And you know what? The emotional connection the narrative builds works. It works to the point where I felt bad for enjoying the game. It works to the extent that more than once I had to turn it off and take a break, because I didn’t want to know what came next, what horror of the battlefield I would be forced to actually stop and think about. But I kept coming back to it, for the simple reason that it was a compelling experience. A game where in many ways the game play was secondary, a mechanism by which something bigger was delivered to the audience. The last game to do this for me was Heavy Rain, an excellent game where once again the story dominated. The difference between the two, however, is the game play. Heavy Rain made use of quick time events, a style many gamers are not fond of. Spec Ops, however, retains the mechanics of the genre, emphasising the contrast between itself and what players have come to expect from military shooters. I realise that in this review I’ve been extremely vague as to the events which occur during the course of the game, as I believe that too many details would spoil the impact of the story. Suffice to say the way in which Spec Ops: The Line manages to get you to emotionally connect with it is what raises it from that generic 7.0 to, in my opinion, something nearing a 9.0. It’s why I would whole heartedly recommend it to anybody looking for something more than a game, for somebody who wants an experience they won’t forget.